With the cold weather rolling in, there’s no better time for a hearty bowl of soup. While some cream-based soups can be calorie traps, making your own soup at home is fast, economical and healthy, because you can control what ingredients and how much of them you put into the soup. To shake up your soup routine, try some of our favorite techniques, including adding new vegetables to your favorite chowders, skipping the meat in your favorite chili and cutting down on the cream. You’ll still have that satisfying bowl of soup that will help take away the chill right up until spring. Creamy Broccoli Soup: If the cold weather leaves you craving creamy, comforting soups, you can skip the cream, flour and butter that give most cream soups their velvety textures. Use white bean puree to add depth and consistency to a lightened-up cream of broccoli soup that delivers fiber and nutrients along with taste. Kale Chowder: Sometimes, chowder means a thick and creamy soup. That isn’t the case with this veggie-packed version that delivers a whole lot of taste for a lot less fat. Get a serving of leafy greens in with this hearty soup that will warm you from the inside out – and pairs perfectly with a tossed green salad and whole grain bread. Onion Soup: If you’re watching your diet, you probably thought that onion soup, packed with croutons and a cheesy crust, was off-limits. Now, you can enjoy your favorite soup, flavored from the natural juices that come from cooking onions low and slow for several hours. Provencal Beef Stew: After a long day, come home to a thick, vegetable-laden beef stew that’s been simmering in the crock pot. Use a lean cut of beef to shave calories and instead of a thick gravy full of saturated fat, use pureed pinto beans to add fiber and bulk to this hearty stew. Taco Soup: Turn up the heat with a zesty taco soup that will not only keep you warm, but add a little spice to your mealtime. Cut your craving for Mexican food without the calories and saturated fat of traditional dishes. To round out your meal, serve with homemade cornbread or a fresh, green salad. Weight Watchers Vegetarian Chili: If you long to warm up with a bowl of chili on a cold day, it doesn’t have to wreck your diet. Opt for vegetarian chili to cut fat and increase your veggie intake. It’s even been reported that going meatless once a week can reduce your risk of chronic conditions like cancer, heart disease, diabetes and obesity. 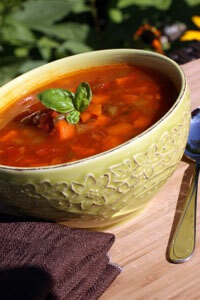 What’s your favorite cold weather soup?